When it comes to saving, the good news is that we are. New Zealand households have been spending less than they earn (in other words, saving) for several years now. Those savings need to be invested! The Canstar savings report analyses the term deposit and at-call savings accounts on offer by New Zealand’s financial institutions; we have researched what is on offer from seven institutions, assessing not just the interest rates available over the period of analysis but also the fees and other features. The Canstar Bank of the Year – Savings Award is presented to the institution that consistently offers outstanding value across the variety of savings accounts detailed earlier in our report. This year, Canstar is pleased to announce Westpac as winner of the Bank of the Year – Savings Award. Westpac has a strong range of savings products across all product areas we assess and performs well across the board. Its Online Saver account offers a competitive rate of interest (currently 2.65% per annum), calculated daily on the full credit balance. While transactions made at another bank’s ATM will incur a $1 charge each time, this is a cost that is within the control of the account holder. All online and ATM transfers are free, as are electronic deposits. Savers also receive five free phone banking transfers per month and there is no account maintenance fee. In addition, Westpac’s online banking is exceptional; Westpac has been working hard to take its online banking experience to a new level and its launch of the bank’s new internet and mobile banking platform, Westpac One, earlier this year means that Westpac customers are provided the same experience on whatever device they choose to use – desktop, tablet, smartphone. Westpac’s inclusion of savings tools within its online banking allows their customers to easily access their spending behavior and have it categorized and graphed automatically into what they spend most of their money on. They also provide a budget planner for you to develop your own savings plan for the future as well as budgeting advice which provides their customers with the ability to make a detailed plan of what they can save on whether it being fuel, groceries or just general goods. Westpac One offers full banking functionality – 120 plus services – on its integrated platform. Westpac term deposit products offer an easy to open account with competitive rates at time of assessment, as well as easy transfers at maturity to other accounts external or internal to Westpac. Westpac also offer a range of features including no penalties for partial withdrawal, an auto rollover facility and an array of interest options ranging from interest to be paid to a nominated 3rd party account to the interest being paid to another financial intuition. Westpac has a great incentive saver account; the Online Bonus Saver has a base rate of .10% but holds a bonus rate of 3.70%. The best part is the account does not require any specified deposit amount to gain this bonus interest, the only conditions to achieve this is to place a deposit in the account once per month as well as having no withdrawal. Westpac’s online bonus saver also has some great features including no minimum opening deposit amount and full functionality via Westpac’s online banking platform. There is also access to facilities such as a direct credit facility and sweep facility and the option to be a 100% mortgage offset account to help maximise your saving potential. 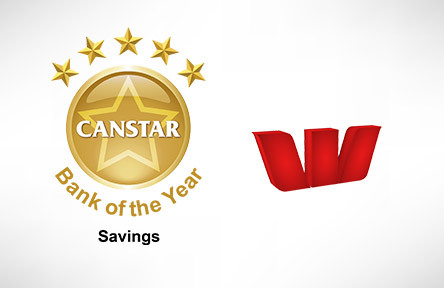 Canstar congratulates Westpac on taking the Bank of the Year – Savings Award for 2015.